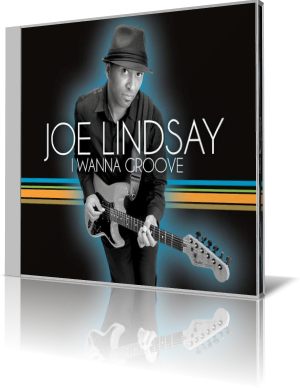 Based in Charlotte, North Carolina guitarist Joe Lindsay is influenced by his idols Curtis Mayfield, Buddy Guy, Larry Carlton, Prince, Hiram Bullock and Miles Davis. As diverse as his influences are his performance styles with jazz, funk, rock and blues. He worked for James Brown, Roy C and Howard Hewett, jazz stars Ronnie Laws, Brian Simpson and Tom Browne and many more. He just released his debut album I Wanna Groove, which is available at CDBaby. He received support by Rischard Jenkins and Skip Walker (drums), Calvin Richardson and Carey Sims (vocals), John Dillard (bass), and Marcus Anderson (flute, sax). The collaboration with these musicians didn't come from a vacuum, but from a growing community. The Berklee graduate doesn't conceal with the title song his musical origins. The roots lie in the funky seventies and eighties. With the groovy Let's Do It sets Lindsay first accents. Another contributing factor is Marcus Anderson with his impressive interpretation on flute and saxophone. Con Savor takes echoes of the Spanish guitar. The vocals remind me of Steve Oliver's accompaniment style. Underlaid with a black bass Let It Rain thrilled by its flow. Not only Lindsay's guitar excursions but also the groove are the main features of success. With Nobody's Gonna Love You presenting singer Calvin Richardson Lindsay unveils his romantic streak. On Break Time Lindsay also knows how to generate, by repetition of a motif a tension that takes the listener under the spell. The true mastery Lindsay shows up in the sovereign dominance of various instruments on Your Eyes, that he brings in a well planned concept. At Mighty Fine I would prefer real horns instead synth sound. Lindsay shows his true strength in the musical composition and its implementation. North Tryon St. and Gift From Above are good examples. I Wanna Groove stands out from its competitors with catchy melodies, which, despite the limitations in production have an amazing grade.